This Self-Ballasted, Fluorescent Spiral Bulb Uses A Smaller, T2-Size Bulb That'S Designed To Fit In Most Lamps. Using Just 23 Watts, This Spiral Bulb Produces A Soft, White Light At 2,700 Kelvin. Nondimmable Spiral Bulb Features A Medium Base And Produces 1,600 Lumens For 12,000 Hours. 120-Volt Spiral Bulb Is Perfect For Lighting Areas Where Harsh, White Light Is Not Desired. Energy Star Qualified And Rohs Compliant.. This Self-Ballasted, Fluorescent Spiral Bulb Uses A Smaller, T2-Size Bulb That'S Designed To Fit In Most Lamps. 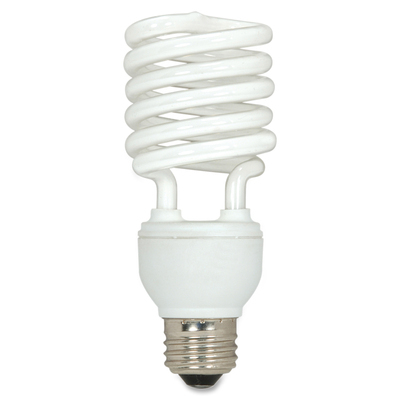 Using Just 23 Watts, This Spiral Bulb Produces A Soft, White Light At 2,700 Kelvin. Nondimmable Spiral Bulb Features A Medium Base And Produces 1,600 Lumens For 12,000 Hours. 120-Volt Spiral Bulb Is Perfect For Lighting Areas Where Harsh, White Light Is Not Desired. Energy Star Qualified And Rohs Compliant.